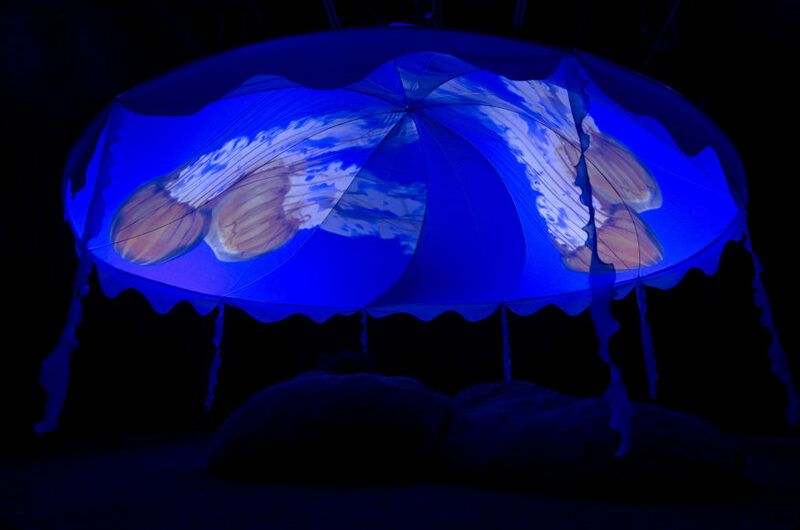 Vanessa Renwick, Medusa Smack, 2012, MOV file, screen, rugs, pillows, 66 x 86 inches. On generous loan form the Jordan Schnitzer Museum of Art, Eugene, OR. The Schneider Museum of Art is excited to present its spring exhibition, Convergence: Digital Media and Technology. The show is co-curated by Richard Herskowitz and Museum Director Scott Malbaurn in collaboration with the Jordan Schnitzer Museum of Art (JSMA) and the Ashland Independent Film Festival (AIFF). The public is invited to a special opening reception on Wednesday, April 5, from 5:00 to 7:00 PM, and the exhibition will be on view through May 27, 2017. Allison Cekala – a Boston-based visual artist and educator primarily working in photography and film. Her work investigates the ways in which humans move, shape, and transform the their surroundings. Cekala holds an MFA from Tufts University, and her work has been exhibited nationally and internationally. Derek G. Larson – an artist who works in a variety of media to create animated sculptures and environments. He combines projection mapping, 2D & 3D animation, screen printing, 3D printing and robotics; with a flux approach to video and installation. He resides in Georgia and holds an MFA from Yale School of Art. Nina Katchadourian – an interdisciplinary artist whose work includes video, performance, sound, sculpture, photography and public projects. Her work has exhibited internationally and her video Accent Elimination was included at the 2015 Venice Biennale in the Armenian pavilion, which won the Golden Lion for Best National Participation. Ken Matsubara – an artist who works with mediums such as photographs and videos to explore the fluctuating manner of memories that reside deep within our consciousness. Matsubara is based in Tokyo, Japan, and his work has been shown in solo exhibitions and purchased for private collections worldwide. Julia Oldham – a video artist working in Eugene, Oregon whose work has been shown at the Portland Art Museum and museums throughout the country. She has participated in residencies around the country, and in the Portland2016 Biennial exhibition. Vanessa Renwick – an artist who has been a singular voice in the experimental cinema world for over 20 years, building authentic moving image works revealing an insatiable curiosity and unflinching engagement with the world around her. She has screened work in hundreds of venues internationally. Peter Sarkisian – an American new-media artist whose work combines video projection and sculpture to create a hybrid form of multi-media installation. Named a Master Video Artist in 2007 by the National Endowment for the Arts (NEA), Sarkisian has exhibited widely throughout the world in major museums and public venues. Lou Watson – an artist whose films have shown nationally and internationally in Australia, Canada, Germany and the United States. She has performed experimental music scores and was awarded the “John Cage Prize for Synesthesia” at the NW Filmmakers Festival. The exhibition will be augmented with special events, such as Hope and Prey and the Medusa Smack, a live performance and two films of nature by Vanessa Renwick with composer/musician Tara Jane O’ Neil providing musical accompaniment, presented on Saturday, April 8 at 7:00 PM. This performance is presented in collaboration with the Ashland Independent Film Festival. Advance tickets are required ($13, students/members free) and there is limited seating. For tickets, contact: www.ashlandfilm.org, 541-488-3823. There will be lectures held by exhibition artists Derek G. Larson on Monday, April 3 at 3:30 PM and Vanessa Renwick on Monday, April 10 at 3:30 PM, both in the Meese Auditorium in the Art Building at Southern Oregon University. Please see the Museum website, sma.sou.edu for additional programs such as First Fridays, FREE Family Days and Tuesday Tours, drop in docent-led tours of the exhibition held every Tuesday at 12:30 PM. Please join us on Wednesday, April 5, from 5:00 to 7:00 PM for a special opening reception held in collaboration with the Ashland Independent Film Festival. A special Members/Volunteers Preview Reception will be held that day at 4:00 PM. Roxy Ann Winery is generously donating and pouring wine for this reception. Convergence: Digital Media and Technology is on view from Thursday, April 6 through Saturday, May 27, 2017. Regular Museum hours are Monday through Saturday, 10:00 AM to 4:00 PM. The Schneider Museum of Art’s spring exhibition is generously supported by a grant from The Ford Family Foundation, Roseburg, OR.